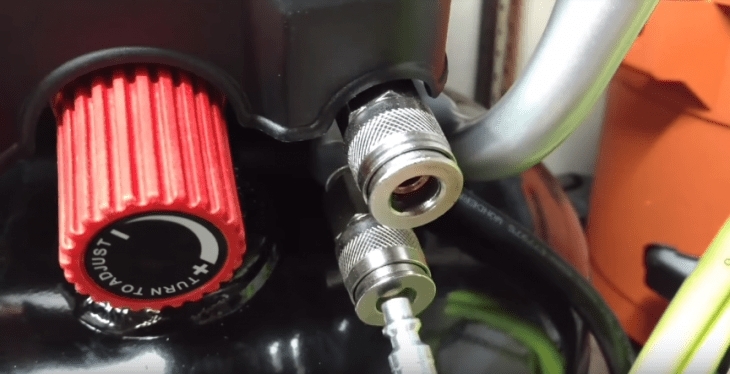 Best Air Compressor for HVLP Reviews: Top-5 in April 2019! Air Compressors for HVLP – Buyer’s Guide! HVLP stands for high-volume, low-pressure. 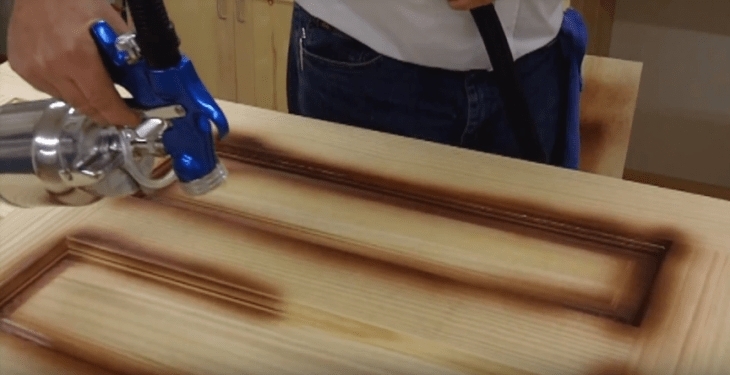 This is a concept in the spray gun world, and this is the method that will give you better, more consistent coverage than conventional spray guns. It also provides minimal messy overspray. 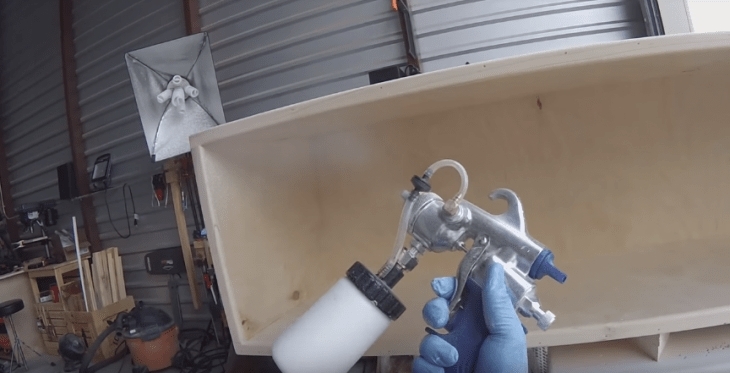 Now, as anyone in the world of air pressure knows, a spray gun’s performance is only as good as its source of air. The inks, paints and artist or sprayer combine into one Zen-like existence, where the constant flow of air at a maintained and controlled rate is necessary to provide the toll and the sprayer with the base for creating a good surface coating or work of art. Now, imagine that not all compressors are built for spray painting. Spray painting requires a continuous draw and not a spurt of power. This means that the air compressor must not work in spurts, the initial burst of air has to be constant over time, and not a large spurt followed by a reduction in strength, sort of like waves on the sea. As such, the atomizer in an HVLP has to be connected to a reliably dedicated air compressor. This article brings you the top five best air compressors for HVLP and considers their cost, maintenance and smoothness of performance to reach this esteemed list. 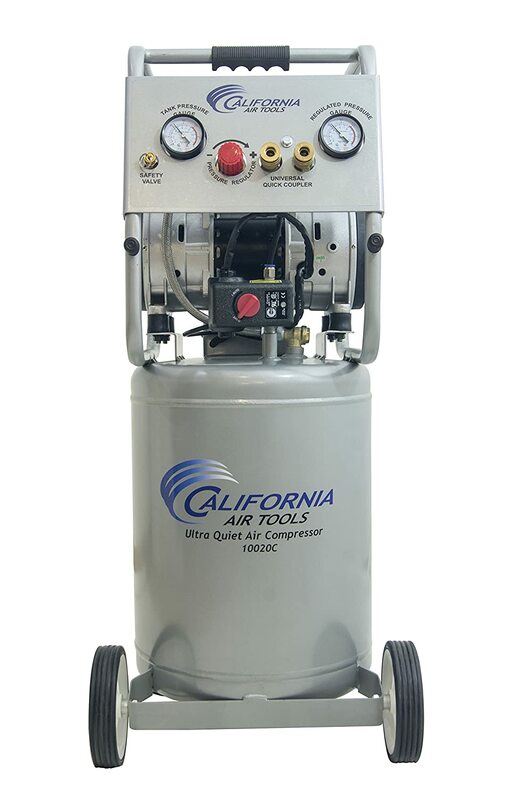 The California Air Tools 10020C is a 2HP unit that is both ultra quiet and oil free. This model works at 70dB only. When it comes to silence, the 10020C is exceptional, since it actually works in allow frequency range, and the highest noise level you get is 70 dB. Combine this with the 2HP motor that operates at 1680 RPM, and you have a very silent but powerful product. Silence and power are great, but you also get an increased duty cycle that delivers longer continuous run times, and this is supported by the oil-free dual piston pump system making for a clean and durable performance. This oil-free environment means you get over 3,000 hours of work, which is 6 times that of conventional compressors. Another benefit of the oil-free system s that it starts off in the cold starts immediately, and since it doesn’t have an oil pump, you can place it on any terrain in any weather condition. There is an easy start valve that releases a small amount of air from the pump at startup. This creates a no-load condition and reduced amp that enables the motor to spin freely with less power load. The unit comes with a large 10-gallon steel air tank, this provides exceptional mobility, and the entire spectrum delivers 6.40 CFM @ 40 PSI, and 5.30 CFM @ 90 PSI. The low amp draw only reaches 14 amps and the time to fill the tank from empty to full is around 2 minutes (120 seconds). The recovery time from 9 PSI to the maximum 125 PSI is only 25 seconds. The unit weighs 82.5 lbs. So its solid and sturdy as well as mobile. This is a nicely priced air compressor specifically designed for HVLP applications. It’s a great unit for all levels of professionalism. 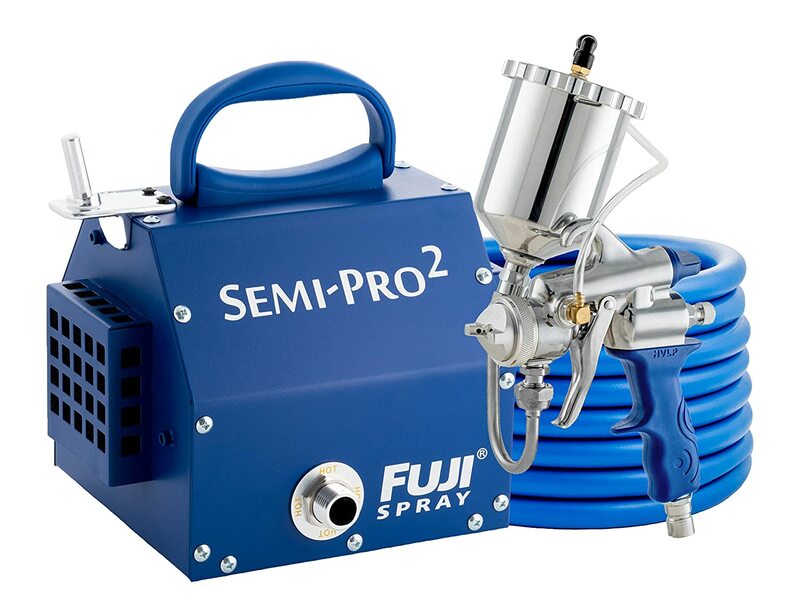 The Fuji Spray® DIY-PRO™ Series comes with this very attractive Semi-PRO 2™ compressor that is one of the more powerful 2-stage systems on the market. 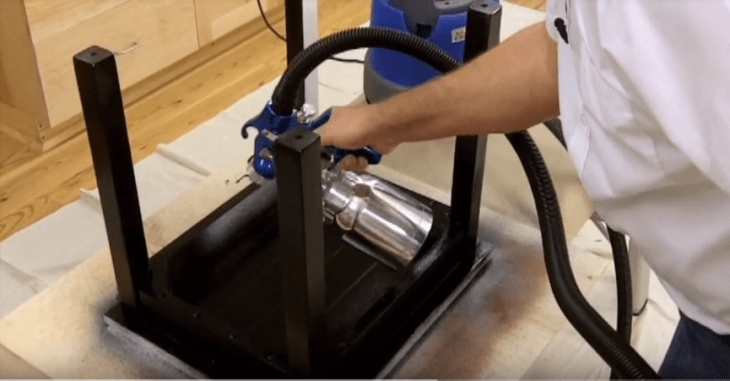 The Semi-PRO 2™ uses a 1400 watt 2-stage bypass motor to handle all the precision painting jobs your HVLP spray gun requires. This model is mid-priced ranged and designed for all levels of experience Ultimately; you can be a beginner as well as a seasoned veteran and get the exact performance levels you require from this exceptional unit. This is an automatic spray system, which means that the controls are set into the base and makes it easy to preset and just work without too much fiddling around. This is not just an air compressor; it’s a complete set that comes with the air spray nozzle as well. The nozzle and gun are made of stainless steel, and the aircap is 1.3mm dia., the cup capacity is 1,000cc, and the whole model with all attachments weighs 25 Lbs. This is a comfortable, complete set that comes at an affordable price when you consider the components and the completeness of the set. With this, take into account it is a small unit and is best used for DIY and home applications, or as a contractor on the go HVLP. 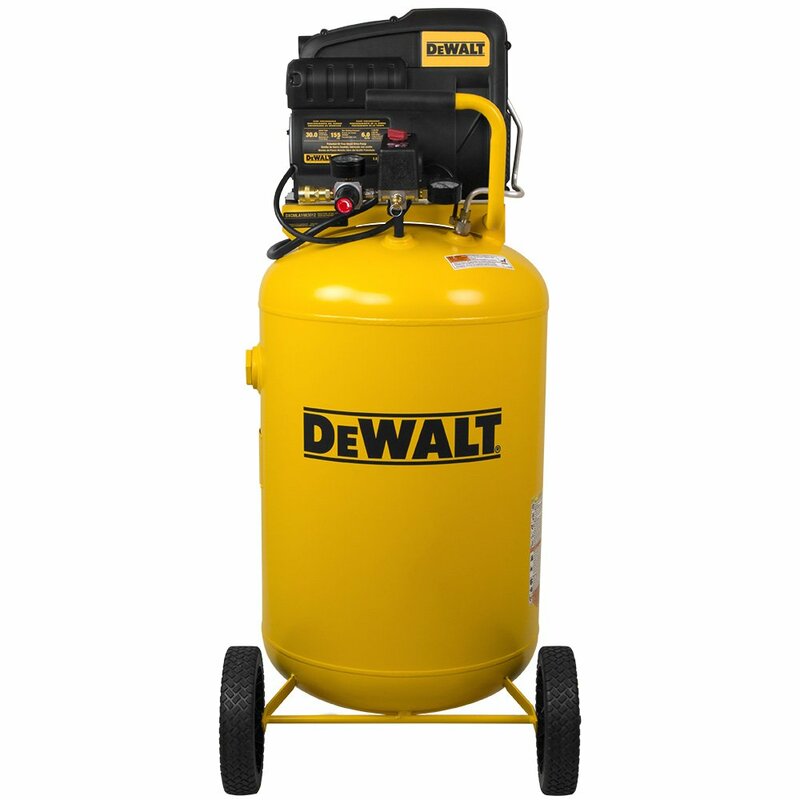 The DEWALT 30-gallon compressor is a 1.9HP cast iron, twin cylinder, oil lubricated pump that provides a maximum (blow off) pressure of 175 PSI. DeWalt is a leader in equipment devices for industry, and this includes bespoke air compressors. This is their 30-gallon model that delivers 5.7 CFM @ 90 PSI. Its maximum PSI is 155, and it will blow out when it reaches 175 PSI. What you get is a durable, 1-piece cast iron crankcase with an aluminum head and valve plate that is used to dissipate heat. The stainless reed valves and automotive style ball bearings combine to provide excellent performance and long life reliability, and there is a 12” flywheel made of cast iron for safety. This beast weighs in at 190 Lbs but is totally portable on its large industrial rubber wheels and has a convenient on and off switch making it perfect for effortless applications. This is a tank horse, which is better than a workhorse. Its solid, tough, resilient and dependable It is also built for long jobs that require constant pressure for hours at a time. It is priced exceptionally well for its performance and delivers one of the best value for money ratios on the market. 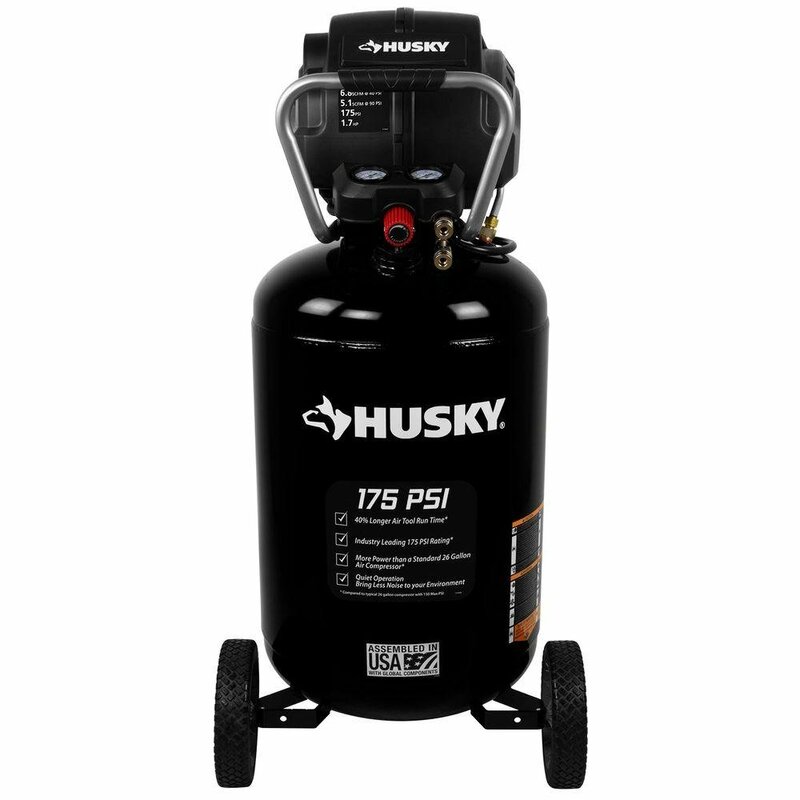 The Husky is a relatively small “large” 30-gallon compressor that delivers a maximum pressure of 175 PSI. Husky is a Home Depot brand, which means its got some serious back to it, with the Home Depot customer service supporting you all the way. This compressor delivers 6.8 SCFM @ 40 PSI, and 5.1 SCFM @ 90 PSI, and when combined with its 30-gallon container you get some impressive performed standards being delivered for longer work hour requirements. The noise level is set at 78dB which is decent and not too loud. The 150 Lbs. 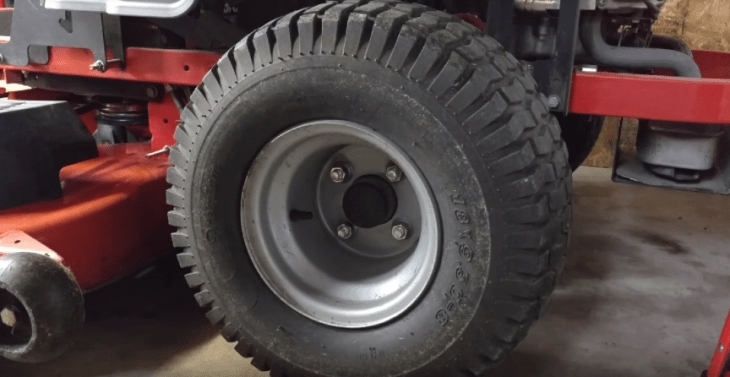 the unit is supported with 9: rubber wheels, so while it is rugged and solid, it is also very mobile. This is an oil free model, so you eliminate the need for oil and oil filter changes, which reduces maintenance costs and downtime considerably. This is an exceptional model but priced in the high range, which is unusual since it’s a Home Depot brand. Having stated this, the Husky is a great brand and will deliver the goods, but the cost is, in my opinion, a barrier. 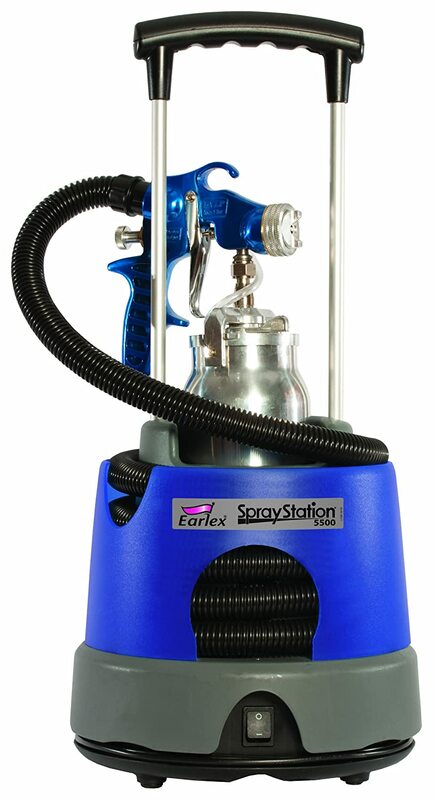 The Eralex HV5500 is a spray station, so you get both the compressor with the spray gun in one kit. This is a conveniently designed space-saving package for DIY applications more than full-time professional requirements. If you are seeking a very convenient and portable spray station unit for home applications, then this is the model you should consider. To be honest, this is a low-price budget model for beginners and contractors that are called in for maintenance spray work. What you get here are three spray patterns; two for flat surfaces, and one for detailed work like spindles and rough surfaces. The fan comes with an adjustable width from 1” all the ay up to 12”, and the pattern switch is a fast push and clicks operation. 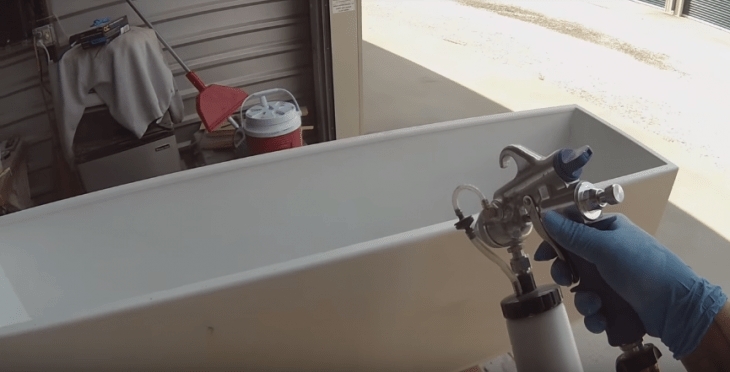 The spray gun comes with a one-quart Teflon coated container, and the design of the body is such that it cannot tip over without extreme prejudice, it also comes with a convenient carry handle. The whole unity only weighs 11.9 Lbs. 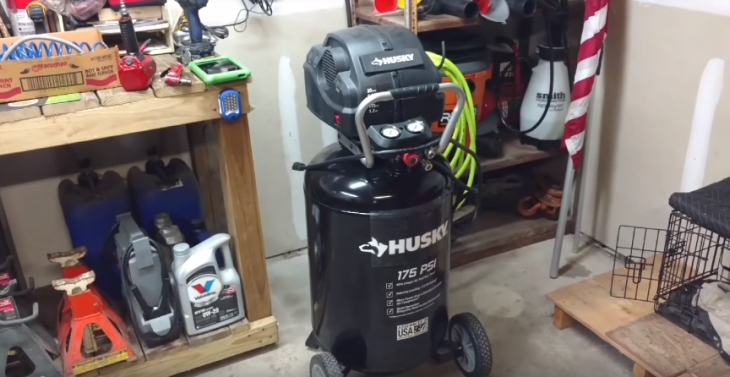 The compressor is a 650W 42 CFM @ 2.2 PSI model, and you get a 13′ paint hose and 5-1/2′ power cord for extra mobility. This model comes with a 2.0mm (0.08″) stainless steel tip and needle. If you are a beginner, or a contractor with a need for a quick fix unit, or just a home DOY enthusiast, this extremely budget-friendly model will provide you with the basics. I wouldn’t use this for more than surface coatings, it’s not really designed for fine needlework, but it is an exceptional tool for the price you pay. Consider this; you don’t need a lot of PSI for performance painting. 10PSI is more than enough for most jobs. What you need to concentrate on are the cubic feet per minute [CFM], a higher CFM means that your compressor can meet the demands and provide a constant flow of air. So, the first rule of engagement when buying an HVLP compressor, CFM rules. The higher the CFM, the better workflow, and performance you will receive. As such, when comparing products, look at the CFM @ PSI to Cost and Energy Consumption ratio to get the actual cost value. Consider also the overall usage capacity. Are you in need of a workhorse? If so, you need a dedicated compressor unit with a high capacity tank separate from the spray head, and buy spray heads to meet specific applications. If you are not in the spray paint business, and only use it for home or partial contractual jobs, such as landscape gardening fixes, then a bespoke package is perhaps your best investment. Air Filters for 3.5 Ecoboost – Buyer’s Guide! RC Transmitters For Planes – Guide For RC Enthusiasts! 2S Lipo Batteries – Buyer’s Guide! Short Course RC Trucks – Buyer’s Guide! Indoor FPV Quadcopters – Buyer’s Guide! On-road RC Cars – Buyer’s Guide!